Just a few weeks ago, I signed Audrey up for Kindergarten. You would think that with her being my second, the thought of this would be easier for me. It’s still really hard, but in a different way. Evan, being the oldest, got my undivided attention for the first two years of his life. Our days consisted of reading books, playing with cars, and spending good quality time together. Audrey never had that. She’s always had brother or sister to compete for attention with. Plus I’ve got WAY more stuff going on to distract me now. I’m finding myself wanting to hold on to her longer. Wait… I haven’t done enough with her. She’s not ready. It can’t be time already. Since I can’t freeze time, I’ve decided to squeeze in as much quality time with her as I can. 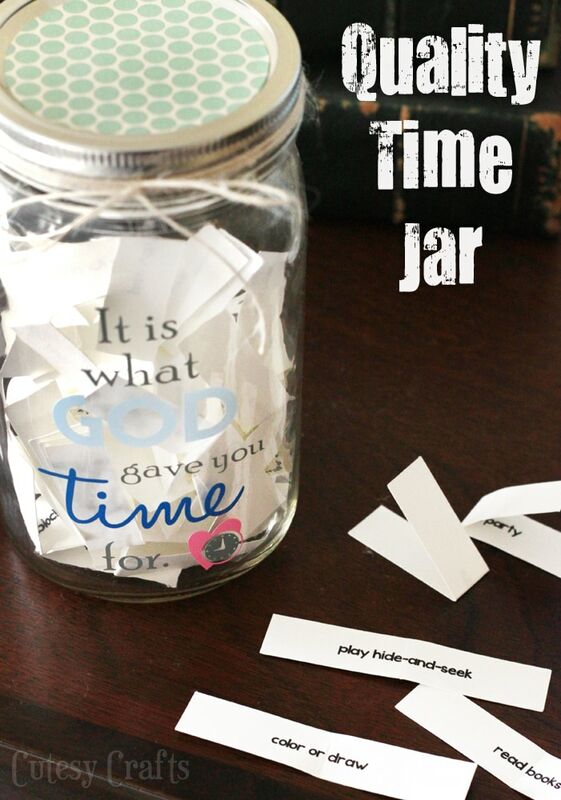 Thus, the quality time jar was born. The vinyl quote on the front of the jar is actually part of a quote that you may recognize. The entire quote by Rachel Janovic reads, “Motherhood is not a hobby, it is a calling. You do not collect children because you find them cuter than stamps. It is not something to do if you can squeeze the time in. It is what God gave you time for.” (Motherhood Is a Calling (and Where Your Children Rank). It was later quoted by Elder Neal L. Anderson, an Apostle of our church. It’s something that I try to remember on a daily basis… My children are my most important calling. They are what God gave me time for. 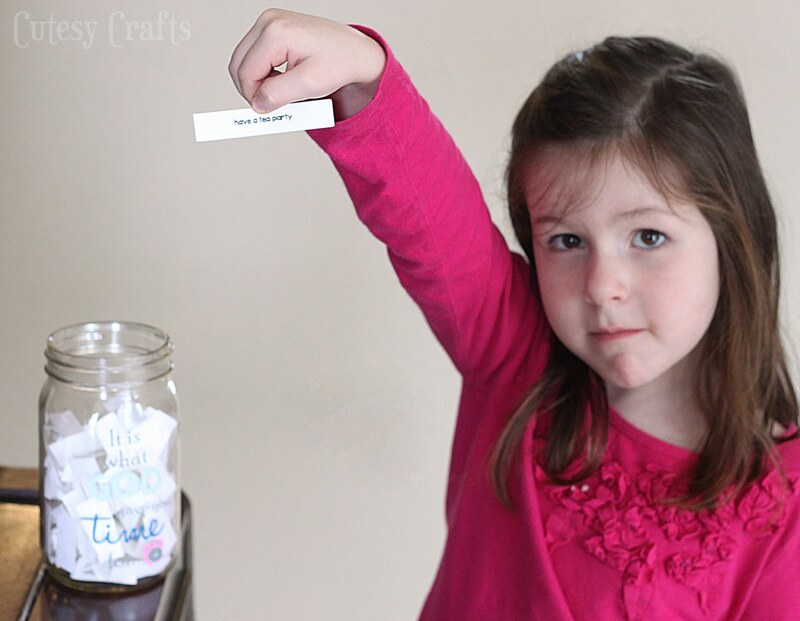 Inside the mason jar are 50 strips of paper with simple activities that I can do with the kids. Things like reading books, painting, or even just watching a show together. 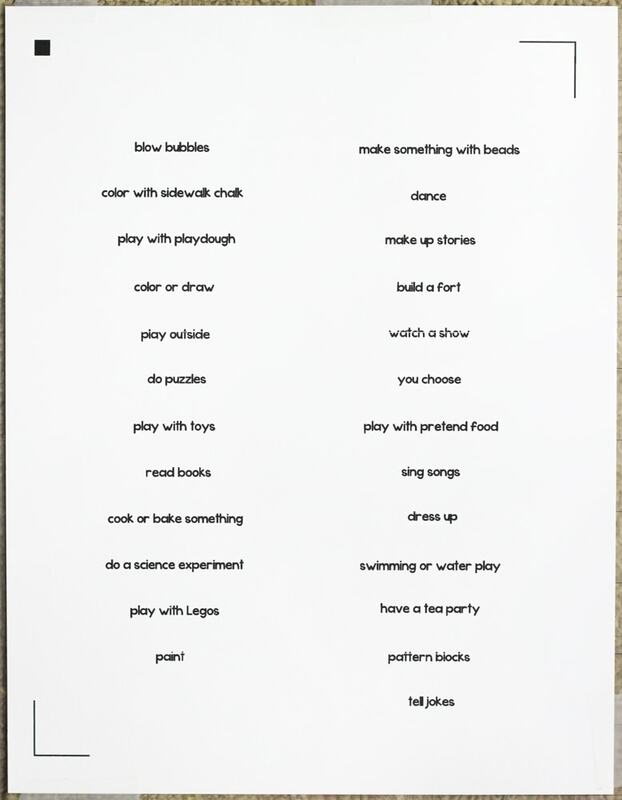 At different times during the day, each of the kids picks a paper, and we do that activity together for 20-30 minutes. Easy. Not saying I don’t spend any other time with them, but this time is special. Just one-on-one quality time. I used the print and cut feature on my Silhouette for the first time ever for this, and I loved it! So easy to do! I just printed out the words and registration marks on cardstock, and then sent them through the machine. 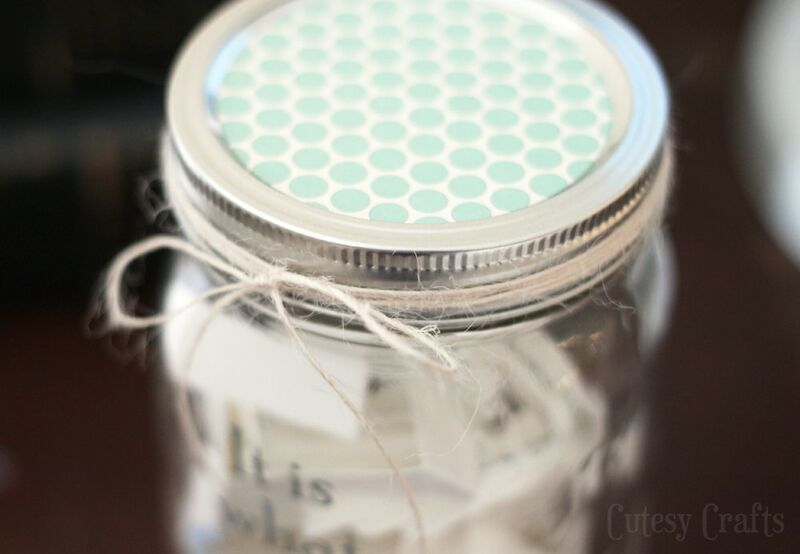 The end result was perfectly cut strips of paper for the jar. 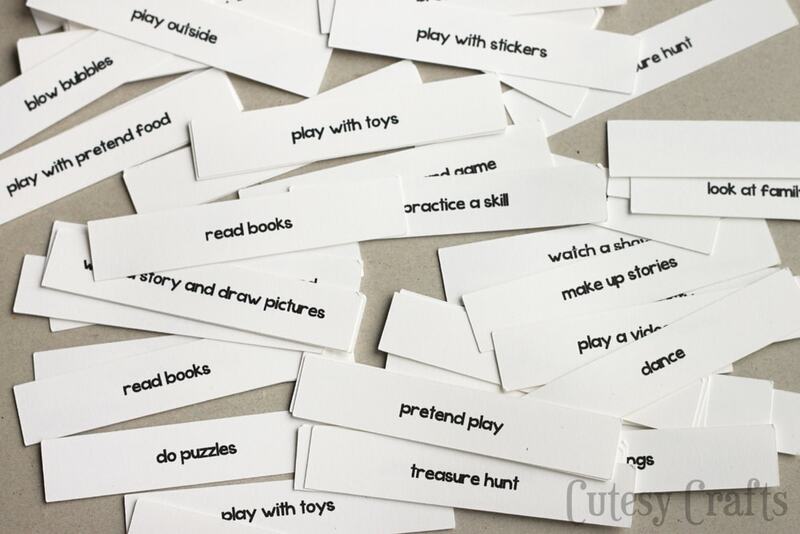 If you’d like to use my cut files or get a list of the activities that I used, go here. To use my activity cut files, you will need to download and install this font. I cut a circle piece of scrapbook paper to cover the top of the lid and wrapped some twine around it. The quote is all vinyl and cut with my Silhouette as well. The little heart shape with the clock is a design from the Silhouette store here. You can download my cut file for the words here. So how’s it been going? So far so good. I’ve only been doing it with Audrey for the past week, but Evan will be starting up soon. My husband said he even wants to start doing it with them. I think that’s so great! 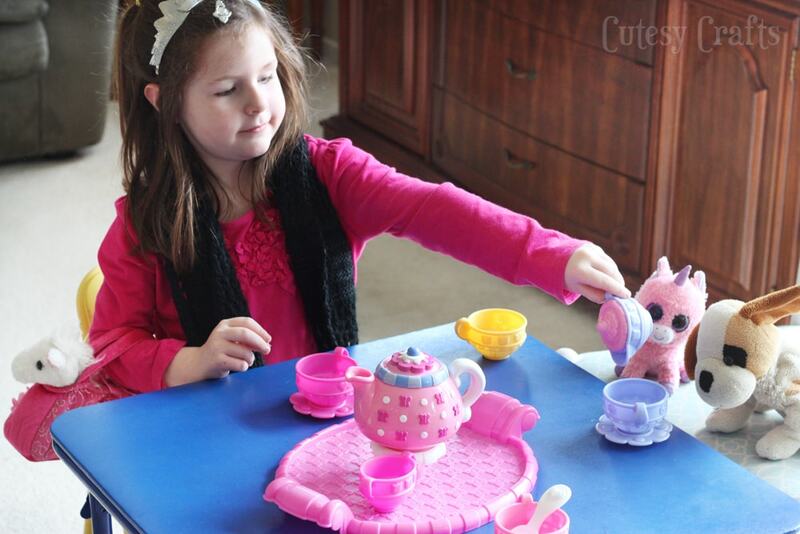 Last week I went to Audrey’s “house” for a tea party. She LOVED every minute of it. We dressed up, invited some animal friends, and broke out the play food. It’s something small that I can do every day, that I think will add up to something big. Is it making me feel better about Kindergarten? No way. But that’s just life. I don’t think stuff like that ever gets easier. My Silhouette Challenge buddies and I are all sharing projects on our blogs today, so peruse the projects below for a wealth of Silhouette inspiration! Just click an image that you want to see, and it should take you to their pages! This is so sweet, Jessica! I definitely could use a push like this to spend more quality one-on-one time with my kiddos. I love that quote, thank you for sharing. My second is barely a month old and I’m already feeling like i don’t want her to grow up. It ‘s so different from the first. This jar is a great idea. Thanks Sarah! It’s definitely different with two! My life dream was to be a Mom.It is a very important gift to raise children but, the best gift of my life. My young men do not need me as a Mommy anymore but, I will always be their Proud Mom. One-on-one time is so precious and you are a very thoughtful Mom. This is just so wonderful on so many levels! 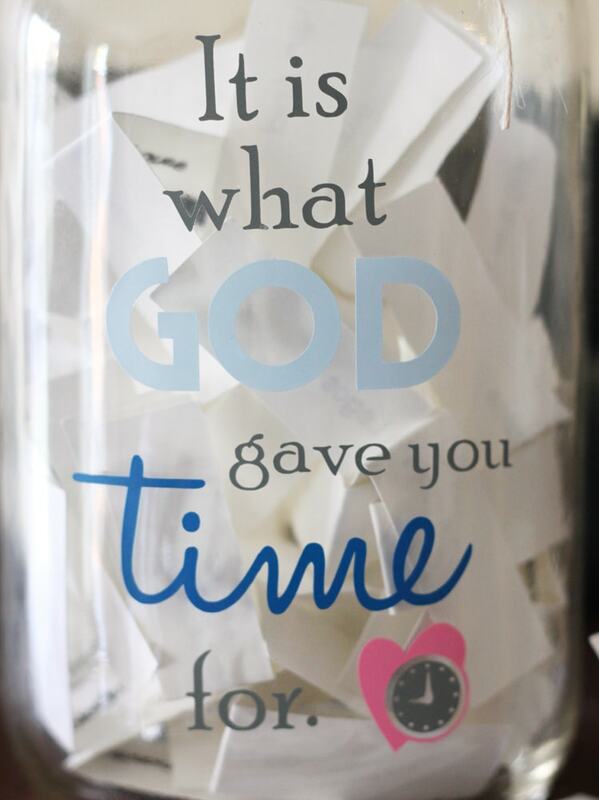 First of all, I love the jar and the quote, it’s really cute…I also love your list of activities (I’ll be pinning and coming back when Addy’s a little older, though many of them she can do now! )…but most of all, I love the sweet mother’s heart that you revealed in this post! I think that guilt just comes with being a mom, there’s nothing you can do about it…I struggle with guilt immensely…but know that guilt is not from God and you are so very clearly a wonderful mama to your little ones – He designed you that way! 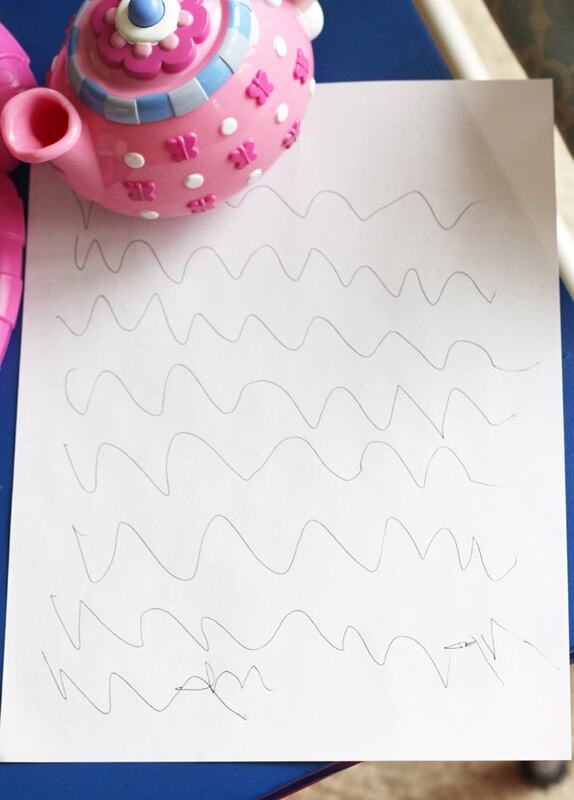 I love this idea so much, thanks for sharing…and I hope you have a wonderfully precious time with your little girl before she goes off to Kindergarten in the fall! Thank you so much for your kind words Meredith. I think we all suffer from mommy guilt from time to time. It’s so hard to find a balance! How beautiful, the idea is a lovely one, and as a mom to three teenagers, I can tell you that the special one on one time is something your children never outgrow. Thanks Meredith. I can’t even think about having teenagers! Although I’m sure that time will be here before I know it. What a wonderful project Jessica! I struggled with this many many times when my children were little. I used to think having a clean house was so important. You’re so right, God gave us our babies and the time to spend with them. I wish I would have let the toys stay out a little longer or let the clothes go another day. Now my children are older and oh how I wish I had time back. THANKS for sharing and I know there are many GREAT moms like you that will be putting your idea to use!! I love the idea and I LOVE your jar. The heart with the clock in it is a precious image. Thank you for sharing! This is an awesome idea. I love all the fabulous things you Mums do for your kids. Makes me wish mine were littlies again….well no not really… but you are giving me great ideas for when I have grand kids one day! Hahaha. I hear grand kids are the best! Wow. What a lovely idea. My little man just turned 2, and I am finding that as he “needs” less and less of my attention, I have started to pay less attention (but to be fair to myself, he is also sleeping less). 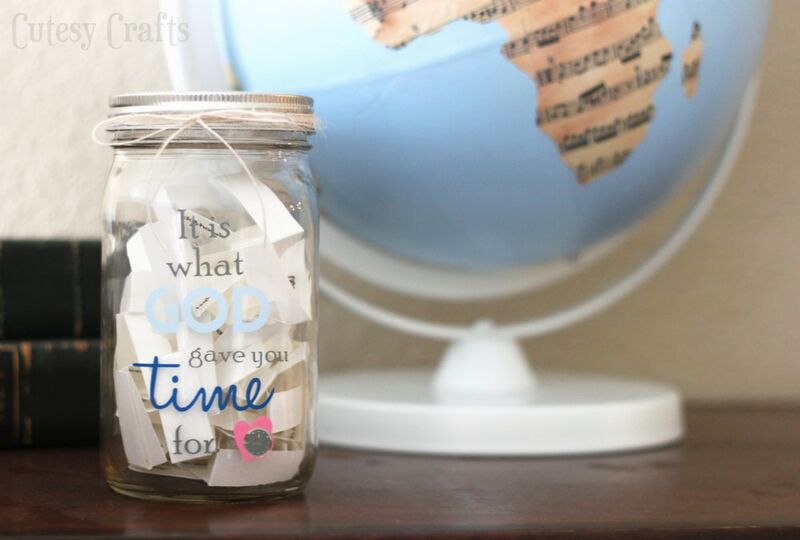 Since realizing that, I have been trying to spend special time everyday, but sometimes he gets whiny or hungry or whatever, your jar is a great way to work impromptu quality time into your everyday life. Thanks Laura. Ah, terrible twos! 🙂 Just wait… 3 is worse! This is such a sweet idea! My kids are all grown up, but I think this would make a lovely gift to young mothers that I know! I’m so happy to be a part of this wonderful Silhouette Challenge group! Thanks Joy. Good idea to give it as a gift. I love this idea! It would be perfect for date nights too. I love this idea! for myself! I don’t have kids, but I work a lot, and forget to read the books I have downloaded or to occasionally take a walk outside! Thank you for sharing! What a fabulous idea! I need to do this with my grandsons. I love this idea – would be great for my siblings! 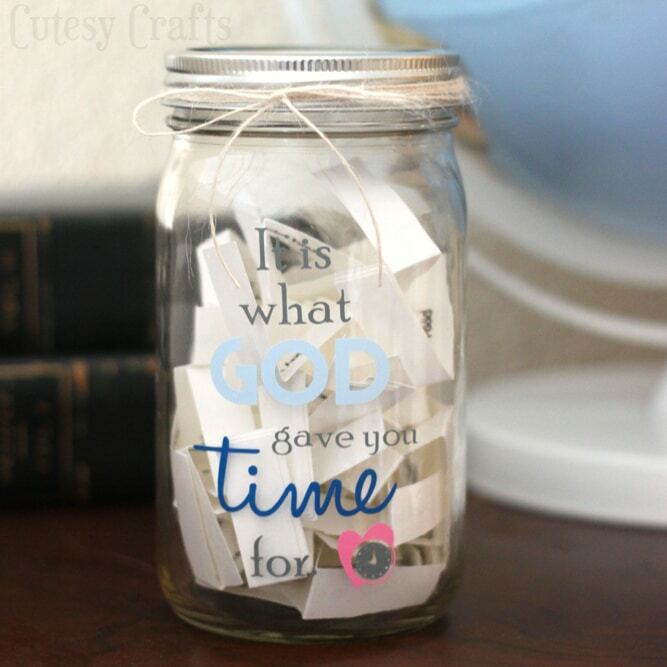 Love the quality time jar! I think I will make one with date night ideas for me and hubby. That’s a great idea Kelly! 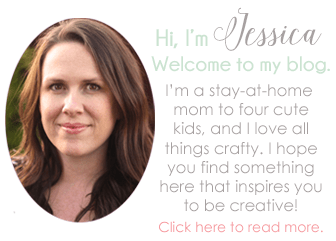 Jessica, this post warmed my heart so much…and also just speaks to what an incredible Mom you are! Nobody’s perfect, but I think that intention is everything…and I love that you’re not dwelling on the past or saying “would’ve could’ve should’ve” but focusing on what you can do right now. And quality time? Well, that’s one of the greatest gifts you can give your children. Pinning this for the someday! And to share with Pinterest-land because THIS is what it’s all about. 😉 Hugs! Thanks Lauren! My kids are having a lot of fun with it!